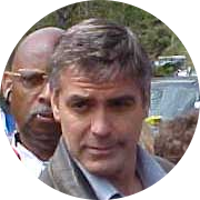 George Clooney is an American movie actor. As of 2012, he has received a number of Academy Award nominations and has won two. He won Best Actor in a Supporting Role for Syriana in 2005, and Best Picture as a producer for Argo in 2012. George Clooney was born in 1961 to Nicholas Clooney and Nina Warren. His father Nick Clooney was a former television journalist, anchorman, and game show host. Nick Clooney might be best remembered as the co-host, along with Bob Dorian, of cable channel American Movie Classics during the 1990s. In addition to his father Nick Clooney, the closest of George Clooney's famous kin would be singer and movie actress Rosemary Clooney who was his father's sister. Rosemary married Puerto Rican actor José Ferrer. Two of their children, first cousins of George Clooney, are actors Miguel and Rafael Ferrer. Undoubtedly the most famous of George Clooney's kin would be President Abraham Lincoln. George Clooney is a descendant of Lincoln's maternal grandmother Lucy and depending on which side of the Lincoln-Hanks debate you fall on, George is probably also related to a number of other famous kin including the outlaw Jesse James, mutiny on the Bounty leader Fletcher Christian, signer of the Declaration of Independence Benjamin Harrison V, and a number of U.S. presidents. One of George Clooney's 7th great-grandmothers is Sarah Woodson who married Thomas Shores in Virginia about 1754. Some of the genealogies found online claim that Sarah is the daughter of Sanburne Woodson who first married Elizabeth Hughes and second Charity ______. However I have found no evidence to support this claim other than it appears that Sanburne Woodson did have a daughter named Sarah who would be about the right age. If evidence can be found that Sarah is the daughter of Sanburne Woodson, this would open up a new connection for George Clooney to a number of other famous kin including first lady Dolley Madison and the outlaw Jesse James. Many of the genealogies published on the internet include George Clooney's great-grandmother Nora Edwards, wife of Ansel Leroy “Roy” Edwards. Many of these genealogies list Nora as the daughter of James Zachary. This is incorrect as Nora is actually the daughter of Cicero and Martha Jane (Wilburn) Perkins. The Nora who was the daughter of James Zachary was married to Elmer Edwards. There are a number of coincidences regarding the two Nora Edwards that I believe are the reason for the confusion. These are explained in the family group page for Nora Bell Perkins on FamousKin.com.